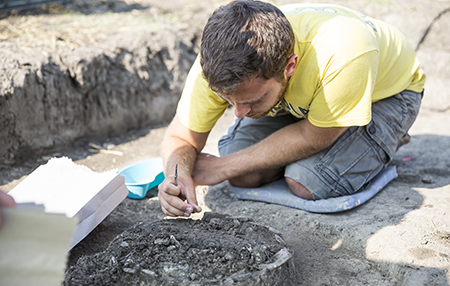 Quinnipiac student Matthew Capece collects samples from an archaeological site in Hungary. For six weeks, under a scorching sun, Matt Capece ’16 carefully and methodically removed layers of dirt in one family’s private yard in Hungary to search for bones human bones. Below the flat landscape in southeastern Hungary ornamented with fruit trees, gardens and rows of crops are the remains of people who lived and were laid to rest there 4,000 years ago during the Middle Bronze Age. Bone fragments, as well as other artifacts, show how these people were buried, and more important, what that says about how they lived. “When you pick up a small fragment of bone in the field and realize that it was once a piece of a living person, with a name and a story, that is what is most amazing to me,” said Capece, a biology major. He and fellow QU diagnostic imaging student Edward Bormann are part of an archeological team unearthing and piecing together these stories, one bone fragment at a time. The students are conducting research at the Middle Bronze Age cemetery and settlement of Bekes 103, which is now used as a patchwork of private farmland, as part of the Bronze Age Koros Off-Tell Archaeology (BAKOTA) Project. This year Giblin received a $358,558 National Science Foundation grant that will enable up to 30 students from across the country to participate in the six-week research and field school over three years. The grant is aimed at sponsoring underrepresented students and those who don’t have this type of research opportunity at their respective institutions. The goal is to provide them with the analytical skills needed to enter science-related fields such as archaeology. Quinnipiac history major Justine Tynan ’16 has been to the BAKOTA site twice with Giblin and returned this year as a lab supervisor through funding provided by the College of Arts and Sciences Student Research Support Grant. A burial urn found during the dig. Jaime Ullinger, assistant professor of anthropology and co-director ofthe Bioanthropology Research Institute at Quinnipiac, was part of a team of specialists who came from around the globe to help mentor students. The Central European Institute at Quinnipiac provided funding for five additional students from Hungary and Poland to participate. Collaborating with members of this international group who collectively spoke 15 languages was a highpoint of the experience, said Bormann. The students worked in teams, guided by a mentor. They began each day at 7 a.m. working in the fields and ended the day evaluating and recording data. 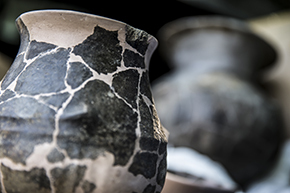 Capece’s team documented bone color and noted fracture patterns to determine the heat and duration of the fire during cremation and how a body was placed in the urn. Bormann used CT scans to determine if there was a measurable difference in bone density between unburned and burned bone. 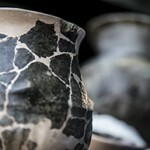 He started the project while at Quinnipiac, scanning unburned as well as burned cow bone. “The data from this was then compared with CT scans of Bronze Age burial urns from past BAKOTA seasons to see if there was a connection,” he said. While he is still evaluating the data, one thing is certain: “This project has shown me firsthand that there is a bigger role for radiology to play outside of the hospital and health care,” Bormann said. A majority of the students are planning to turn these projects into poster presentations for the Society for American Archaeology national conference. While in Hungary, the students also presented their findings to local residents, including how the land has been used over the centuries, which forged a connection between the society they were studying and the people living on the land now. Students agreed the fieldwork was mentally and physically challenging.